The Global War on Terror, Development and Civil Society 4. Is There Life after Gender Mainstreaming? This Companion discusses the complexities involved. Civil Society and the Legitimation of Global Governance8. It is both timely and thought provoking. The Phases of Organization Development 14. 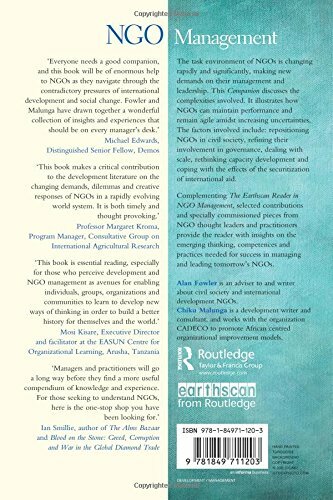 NGO management : the Earthscan companion / edited by Alan Fowler and Chiku Malunga. This volume discusses the complexities involved. Governing for Accountability: Principles in Practice 11. Accountability and Learning: Exploding the Myth of Incompatibility Between Accountability and Learning 28. He is author of 'Understanding Organizational Sustainability through African Proverbs', 'Making Strategic Plans Work: Insights from African Indigenous Wisdom', 'Understanding Organizational Leadership through Ubuntu'; and 'Oblivion or Utopia: The Prospects for Africa'. Civil Society Networks: Of Ants and Elephants 22. Briefing Paper: Policy Engagement for Poverty Reduction - How Civil Society Can be More Effective 19. Options, Strategies and Trade-offs in Resource Mobilisation 30. Fowler and Malunga have drawn together a wonderful collection of insights and experiences that should be on every manager's desk. Seeing Like a Citizen: Re-claiming Citizenship in a Neoliberal World5. Strategic Planning: The Cultivation of Organizational Beauty 13. It is both timely and thought provoking. Knowledge Management Organisational Learning: an International Development Perspective29. Is there Life after Gender Mainstreaming? Bridging Gaps: Collaboration Between Research and Operational Organizations 24. Civic Driven Change: A Concise Guide to the Basics6. Seeing Like a Citizen: Re-claiming Citizenship in a Neoliberal World 5. Civic Driven Change and Developmental Democracy7. Development Effectiveness: Towards New Understandings 26. Knowledge Management Organisational Learning: an International Development Perspective 29. This Companion discusses the complexities involved. It is both timely and thought provoking. Civic Driven Change: A Concise Guide to the Basics 6. The Phases of Organization Development 14. Bridging Gaps: Collaboration Between Research and Operational Organizations 24. Accountability and Learning: Exploding the Myth of Incompatibility Between Accountability and Learning 28. Rights-based Development Approaches: Combining Politics, Creativity and Organisation 16. The Global War on Terror, Development and Civil Society 4. Civic Driven Change and Developmental Democracy 7. The Global War on Terror, Development and Civil Society 4. The E-mail message field is required. Civil Society Legitimacy and Accountability: Issues and Challenges 9. This Companion discusses the complexities involved. Civil Society Networks: Of Ants and Elephants22. Development Effectiveness: Towards New Understandings26. This Companion discusses the complexities involved. Civil Society Networks: Of Ants and Elephants 22. Bridging Gaps: Collaboration Between Research and Operational Organizations 24. It is both timely and thought provoking. Fowler and Malunga have drawn together a wonderful collection of insights and experiences that should be on every manager's desk. Measurement in Developmental Practice: From the Mundane to the Transformational27. It is both timely and thought provoking. Civic Driven Change: A Concise Guide to the Basics 6. Strategic Planning: The Cultivation of Organizational Beauty13. It is both timely and thought provoking. V Managing Organizational Change -- 13. Editor s : Fowler, Alan; Malunga, Chiku. Civic Driven Change and Developmental Democracy 7. The Phases of Organization Development14. Civil Society and the Legitimation of Global Governance 8. This Companion discusses the complexities involved. Is there Life after Gender Mainstreaming? Bridging Gaps: Collaboration Between Research and Operational Organizations 24. Civil Society Networks: Of Ants and Elephants 22.